Product code: N35 Categories: Cotton, Design Edition Limited, Floral Stripes, Luxury Fabric, Multi-coloured. 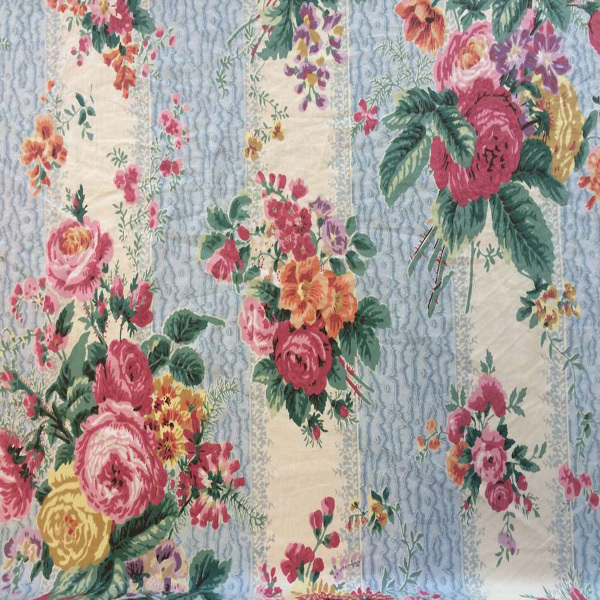 Amberley by Design Edition Limited is a colourful floral and striped designer fabric. Alternating bands of cream and textured effect blue are decorated with pretty bunches of flowers. The cream stripe is edged with a light grey design. While the blue stripe has a bolder marl style effect. The pink, orange, cream and lilac flowers are arranged in such a way that there is good coverage for a blind or cushions. This is a quality 100% cotton fabric. A great designer fabric to add a vintage touch to your home interiors.